My daughter is in the throse of planning her wedding. Although there have been many marriage ceremonies and receptions among extended family members, this is the first for our unit. 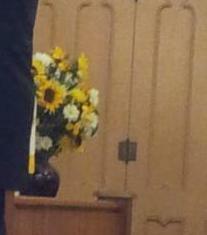 I am grateful to draw on my experience gained as coordinator for nonprofit signature events and church dinners. Activity and meal planning for 200 people is much different than having a home dinner party. There is always a need to work withing a prescribed budget. Wedding and reception decorations should reflect the bride's personal flair while still keeping within set financial parameters. My daughter is asking us to pay for much of the wedding. That translates into a pretty tight wedding budget. One area where brides have almost total control is flowers. Roses and orchids make beautiful arrangements. Unique flowers such as orchids can be stunning when used as a focal point. Leaves, baby's breath and ribbon can transorm it into a delicate arrangement that any bride would be proud of. Flowers that are in season provide the best value, but the least variety. Stuniing bouquets and table arrangements can be made. I've found the price for real flowers to comparable and even less expensive to silk when bought in season. I was hopeful that my daughter will choose fresh flowers that are along the traditional lines for a wedding as they are more easily obtainable. However, what did she choose? Sunflowers. Yes, she chose sunflowers and dasies for a partially indoor summer wedding. And, they happen to be the ones that the mother of the bride are the most allergic to (other than lilies). This leaves me scrambling for sunflower decorating ideas. Given the allergic part of the equation, this means that the flowers will have to be silk. Daisies too. They never hit my radar screen as a wedding flower, but my daughter wants a country themed wedding. So, the search for sunflower wedding ideas began. The bride came up with designs and sunflower ideas that she liked. Her very gifted mother-in-law created stunning arrangements for the wedding. I worked on sunflowers for the reception and our caterer helped. It was a team effort that resulted in lots of complements. 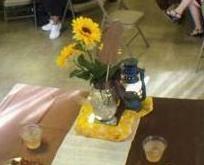 The deep chocolate tablecloths accented the sunflowers well. Here are some ideas that she and I came up with. One my daughter's sunflower wedding ideas was to use mason jars instead of vases. They were filled about 1/3 of the way with garden pebbles and tied at the top with a chocolate ribbon. The jars were then placed on a yellow cloth that then on a chocolate tablecloth. It was one of the sunflower wedding ideas that also worked well for the reception. are looking for sunflower wedding ideas, then check your home first. It may be a treasure trove. Our caterer made a vase out of a watermelon. She cut the bottom just enough to make the watermelon stand upright to hold the sunflowers. The fruit was scooped into balls and served. Thankfully, finding sunflower wedding ideas was easier than finding her gown or choosing the venue.